In June 1980 he fought an undefeated Sugar Ray Leonard for the Welterweight championship and in one of the most exciting bouts that I have personally seen, Duran won a close but unanimous 15 round decision. In the rematch with Leonard in November of that same year, Duran did the unthinkable and quit in the eight round, losing the championship. Duran then moved up another weight class to the 154 pound limit and lost a bid for that title – a 15 round decision to Wilfred Benitez in January 1982. Later that same year, Duran lost in a tremendous upset to Kirkland Lang, a ten round split decision, and many thought, including myself, that this would be the end of his brilliant career – but 1983 proved to be another banner year for Duran. 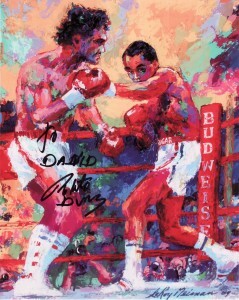 In January 1983 he fought top rated Pipino Cuevas and won by a 4th round knockout to earn him a June title fight. 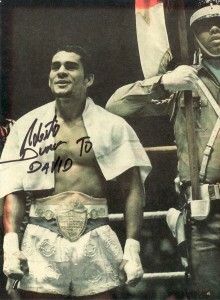 Duran fought for the WBA Junior Middleweight crown, and shockingly, stopped Davey Moore in eight rounds to win that title. In November of that same year, Duran went 15 grueling rounds with undisputed Middleweight champion Marvin Hagler, a fight that Duran lost by one point on two of the three official scorecards. In June 1984, Duran suffered his most damaging loss of his career, a vicious second round knockout by Thomas Hearns. After the Herans KO loss, Duran was inactive for over nineteen months before resuming his boxing career in 1986. He did not contend for another world title until February 1989 when he upset Iran Brakley – who had just knocked out Hearns to win the title the previous year. Duran won a twelve round split decision over Barkley to win the WBC middleweight championship in a bout that was Ring Magazine’s fight of the year. Later that same year, 1989, Duran lost his title by a 12 decision to Sugar Ray Leonard. He went on to fight another twelve years and in that time frame he lost four bids to win different versions of world Middleweight and Super Middleweight titles. Roberto Duran officially retired from boxing after five decades in the ring. In my many years of covering boxing, I have seen nobody better at 135 pounds than Roberto Duran – the “greatest lightweight” ever.